Teeth whitening is a highly effective method of treating discoloured, stained or yellowed teeth. In recent years, it has become a hugely popular cosmetic dentistry procedure for those wishing to get their pearly whites looking bright and beautiful again. Teeth whitening works by bleaching the teeth to lighten colour and remove tarnishes. The best way to tell if your teeth are suited for any kind of whitening treatment is to talk to your dentist. He or she will talk to you about the causes of the issue, and will be able to make an informed decision about which treatment option may work best. Your dentist will also be able to inspect your teeth and gums to ensure they are in a good and healthy condition in order to receive treatment. Plus, as your dentist already knows you and your teeth, he or she will discuss specifics, such as whether or not you’re likely to feel any sensitivity during whitening. Teeth whitening does come with risks, but they can largely be minimised with the right advice from your dentist. Hydrogen peroxide is a chemical and it can have an adverse effect on the teeth or gums, which is why the Australian Dental Association recommends that any products with 6 per cent or higher of this agent are only applied by a trained professional. The worst that most people will experience is a tingling sensation or sensitivity in the gums during or immediately following the whitening procedure. Should this happen, let your dentist know immediately – the symptoms should pass quickly or within a few days but he or she will be able to advise you further. While rare, other side effects can include blistering of the mouth and gums, or uneven coloured teeth. It’s also possible that veneers, crowns and fillings won’t whiten in the same way as your natural teeth, which can leave uneven results. 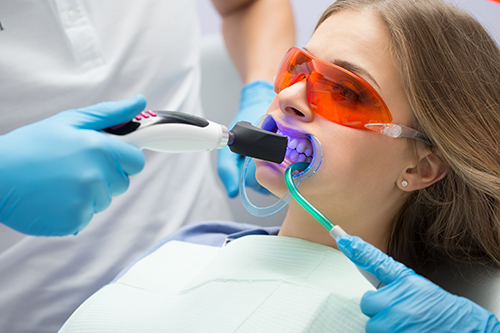 Once you know the risks and options for treatment and are still interested in moving ahead with teeth whitening, you will be able to begin an at-home or in-office solution. To get your teeth whitened quickly, easily and without fuss, opt to have your treatment done in our dental clinic. This intensive treatment combines a professional whitening solution and bright light to boost your teeth by a number of shades on the spot. Treatment times can vary, depending on an individual’s teeth colour and condition. If you’d prefer to do it yourself at home, we can tailor a teeth whitening kit around your situation. This involves taking an impression of your mouth, then creating an upper and lower tray to fit the shape of your teeth flawlessly. You can then apply the solution and wear the tray at a time that suits you, in the comfort of your own home. Call us today to schedule a consultation where we can determine your suitability for teeth whitening treatment, and discuss which methods will best meet your needs.